If you use a simple Barcode Scanner that inputs data as the keyboard, you can use this app to process the scanned ticket barcodes at your Event Entry. 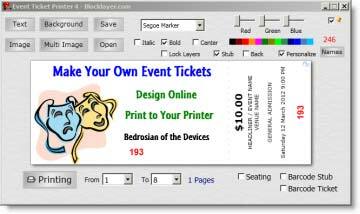 When first started, a visual plan of sequentially numbered tickets is displayed. If you're using a Seating Plan, hit 'Seating' to load the plan. For sequentially numbered tickets, hit 'Numbers' and enter the total number of tickets to scan. A visual representation of the seating plan or ticket numbers will be displayed. If the seating plan is not fully visible, go full screen and adjust the 'Zoom' slider to fit the plan to the screen. Hit 'Start' and begin scanning barcodes. Once scanned, if not previously entered, the corresponding seat will turn red in the visual. If re-scanned, an alert will appear. You can scan the 'Re-Activate' barcode or hit the 'Re-Activate' button to re-activate the ticket and change its color back to green. You may wish to re-activate tickets if your guests leave temporarily and need to re-enter. Hit 'Print' to print Command Barcodes for Re-Activation, Start, Enquire and Speech to scan if you are not close enough to the monitor the program is displayed on. 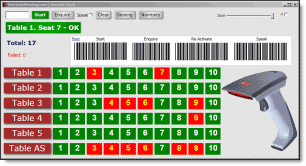 Right click and choose 'Save target as..." to download this Demo Seating Plan to test. You can also directly enter ticket numbers into the textbox and hit return to process, or just mouse click the seat in the visual display to enter or re-activate it. Check 'Speak' to hear entries as they are processed. With speech enabled and printed Command Codes, you can process tickets without use of a monitor.